Saturday October 27th, 2018 - Come help support the sanctuary with a 5K (3.01 miles or as far as you want to walk) fund raiser walk. You can as well pray along the walk with our prayer guide. Enjoy part of the six miles of trails along beautiful Lake Whitehall in a 5K (3.01 miles or walk to your ability) over our roughly one-hour walk. 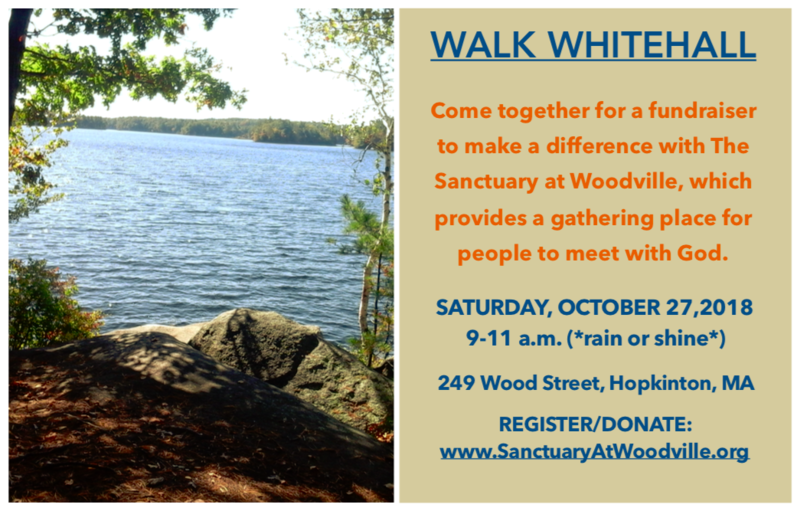 This walk supports The Sanctuary at Woodville’s continued Kingdom work and spiritual formation focus. We ask you to seek donations from your friends and family for your walk. The Sanctuary at Woodville brings people from area churches together to help grow God's work. We are a place where one can come to grow deeper with the Lord with other believers, or attend our various offerings that smaller churches cannot traditionally offer or even plan a personal day retreat. We do not seek to pull people away from their churches, but instead to help them grow them in ways small churches (and some large churches) struggle to. The Sanctuary also provides a place where individuals and church leaders can get away to pray, listen to God and plan in a rural setting that is not far from Boston (40-45 minutes) and Worcester (30-35 minutes). For example a day long retreat with facility cost, all day refreshments and lunch is just $15.50 a person. Included in this is use of the kayaks and canoes if desired. As a walker we encourage you to use the flyer we provide above to ask others to help support your walk for us. Others can contribute for the walk to you directly, or use our web to contribute for you. The walk will be October 27th from 9 a.m. to 11 p.m. There will be a prayer list available of our area you can use to pray as you walk if desired.